Home/ WooCommerce / Why WooCommerce Is More Appropriate For E-commerce Startups? Most online shoppers want hassle-free online buying transaction and experience these days. WooCommerce is just the apt shopping app exclusively for simplifying the online buying and selling the deal. As per the latest statistics, around 51% of the top million e-commerce stores worldwide operate on WordPress CMS. Installing the virtual WooCommerce Store on WordPress site is quite easy. A shopkeeper or the developer will just have to add the relevant plugin and that’s it. It has very simplified user interface making it easier for the retailer to transact online in a safe and prompt manner. No Cost: Unlike other plugins and apps, WooCommerce is totally free and available round the clock. Just add the plugin and activate WooCommerce integration services and the site’s WooCommerce plugin will work very swift. Flexibility and Mobile: Anyone can simply install WooCommerce and enjoy all its facility non-stop. The 2018 statistics of WooCommerce revealed that it has over 3+ million active e-stores worldwide on WordPress CMS platform. An online retailer can also do some simple tailoring as per the requirement. Advantage Online Store: WooCommerce is not just an ordinary shopping plugin. In fact, it also facilitates setting up of an online retail store within an existing website utilizing its content marketing options. 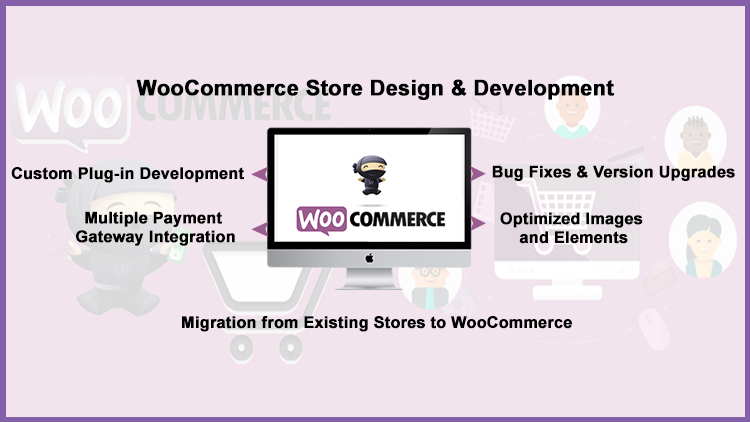 Creative Customization: These days, WooCommerce website development services consulting company is more interested in serving customers expeditiously. That’s the reason why WooCommerce comes preloaded with as many as 39 various attractive and colorful themes offering plenty of options to the online retailers to choose from. WooCommerce Add-On Features: Just because WooCommerce is freely downloadable and installable, an online retailer shouldn’t overlook its exceptional features. More than 2 lakh people use WooCommerce in the United States alone. In the next few months, WooCommerce is large to grab many more consumers across the globe. Order tracking feature is really helpful for the retailer to keep a track record of his orders and supply. Built-in Analytics: WooCommerce comes preloaded with its simplified built-in analytics to keep a tab on one’s sales record and other business deals. New statistics from Cart2Cart revealed that WooCommerce is the online store owner’s favorite shopping cart. It’s a simple and intuitive order tracker simplify the store owner’s task to a great extent. Additional Useful Apps: WooCommerce is not alone. It offers hundreds of extensions for professional purposes to make the site more interesting and attractive. Useful apps relating to marketing, accounting and reporting can be easily obtained using WooCommerce. All entrepreneurs should hire WooCommerce developers to get maximum visibility and sales effected through their site. WooCommerce Web Applications: WooCommerce offers an option to modify its themes, templates, and filters. It also provides relevant APIs for further alteration in the online e-commerce portal. Last year, WooCommerce has grown by around 14% in 2017. With the rise in online competition day by day, it is certain that one who survives the test of the time will eventually win. It is highly recommended to all the online store owners to install this useful app and see how their businesses grow life never before. Online stores should instantly accept WooCommerce SEO expert services to promote their e-commerce portals and let their businesses grown manifold. WooCommerce is not just a plugin but also a lifeline for e-commerce online stores.